I'm thinking of making myself a wintercoat. I kind of need one. I actually made two last year, and I still have an old RTW one... However, the old one is looking really bad by now and is only kept on its hanger in the hallway for those rare occasions when you have to do dirty work outside, in winter. And one of the coats I made was, sadly, the subject of my last real fabric faux pas. It's made from a fabric the colour of raw red cabbage, which looks woolly on the outside. The inside however, is plastic-y knit. This stuff is of such bad quality that it looks completely worn out after just one season in which the coat wasn't even worn every day. The other coat I made is an A-line one in luxurious black wool, with wide black leather edges at sleeves and hemline. I still love it and I hope I will keep wearing it for years to come. However, its shape means it's not ideal in every situation (like going to the market by bicycle...). So, now you know why I'm thinking about making a coat. Now, the question is: what kind of coat? Although I was pondering practical reasons just one line above, I'm never one to really let those overrule the need for style (if I were, I'd just buy a parka and be done with it) so I will still want some kind of beautiful coat. I've got two very different coat fabrics in my stash: about 4,5 m of rather densely woven (and fairly stiff) black wool and 1,5 - 2 m of wool blend with an oversized herringbone weave, in black and beige. The herringbone fabric is loosely woven so it would have to be interlined for warmth. At first I had the black wool earmarked for a long coat, preferably a vaguely '30s style number, so no wide skirts. 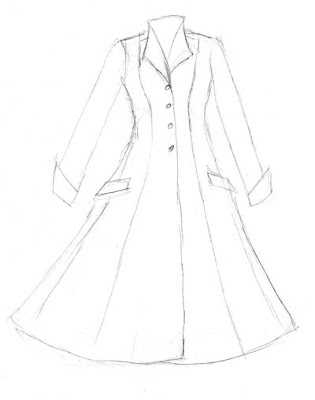 Now, because 1930's coats are usually calf length and have massive shoulder pads, I haven't been able to come up with any likable sketches for such an item. What I did keep coming back to, was this: oh yes, that's supposed to be a New Look -alike coat. 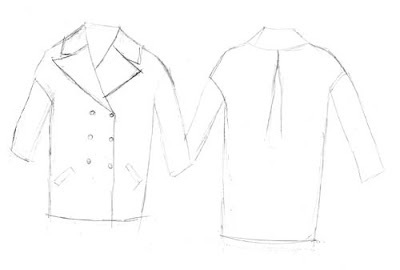 The option for the other fabric is this: a bit tapered swagger, a little masculine and a bit of Balenciaga barrel-coat. What I really like about this, is the notion of snuggling up comfortably in its warmth, which is somehow what the wide top part seems to promise. Do you have any suggestions for me? About these two, or any other great ideas which I just haven't come up with? Both your ideas look great, and can't wait to see the finished results! What sort of machine do you use for sewing thick woollen fabric? Do you have any tips for working with this kind of fabric? What about Vogue 1023 for the Balenciaga inspired one? I am a fan of the coat created by one of the contestants of the show "Project Runway." (The challenge was to make something from newsprint.) The Comments box won't let me insert a link, but if you do a Google Image search for "project runway newspaper irina" you'll see it. I think this might work with either of the fabrics. You'd need to add ... something ... to make the collar and cuffs. Something kind of big and fluffy.